Yard Envy: YardEnvy has Spirit, yes we do! YardEnvy has Spirit, yes we do! It is that time of year again! The smell of football, shooting hoops and Christmas. You may wonder what all of these have in common? Scoreboard Clocks. Whether you are looking for the perfect Christmas present or planning the next Bowl Game party, a scoreboard clock is just what you need. 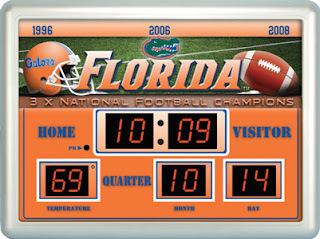 Available at YardEnvy.com, these Scoreboard Clocks are available in College and NFL teams and feature an LED readout of date, time and temperature. Each clock has your team's logo and is Officially Licensed. With the option of putting the clock indoors or outdoors, you can hang one almost anywhere. It's about time to get yours!